The oropendolas comprise two or three genera of South and Central American passerine birds in the New World blackbird family. 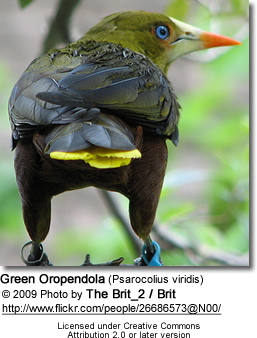 Oropendolas are birds associated with forests or, for a few species, more open woodland. All the oropendolas are large birds with pointed bills, and long tails which are always at least partially bright yellow. Males are usually larger than females. 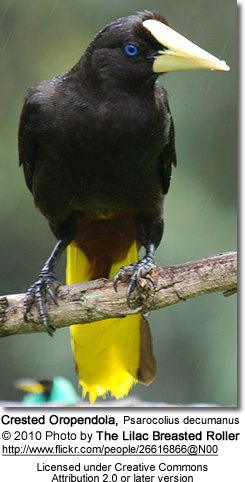 The plumage is typically chestnut, dark brown or black, although the Green and Olive Oropendolas have, as their names imply, an olive coloration to the head, breast and upper back. The legs are dark, but the bill is usually a strikingly contrasting feature, either pale yellow, or red-tipped with a green or black base. In several species there is also a blue or pink bare cheek patch. 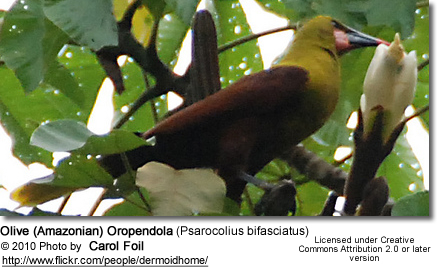 They are colonial breeders, with several long woven basket nests in a tree, each hanging from the end of a branch. 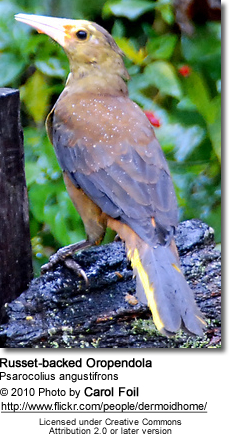 These gregarious birds eat large insects and fruit. They are very vocal, producing a wide range of songs, sometimes including mimicry. Price and Lanyon (2002) used mtDNA cytochrome b and NADH dehydrogenase subunit 2 sequence data to research oropendola phylogeny. 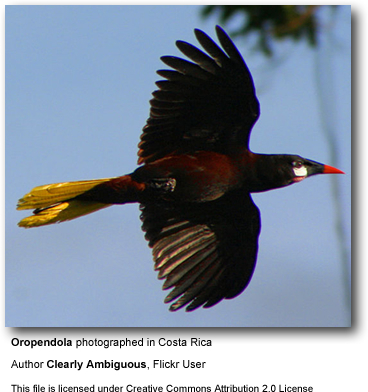 As is fairly obvious from morphology, the Band-tailed Oropendola, Ocyalus latirostris and Casqued Oropendola, Psarocolius oseryi are the most distinct oropendola species. 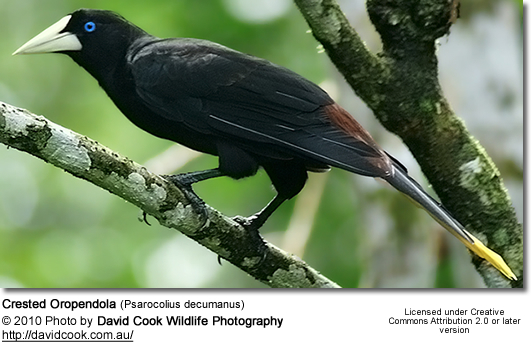 In fact, they appear to be more closely related to the caciques and both species would go into Ocyalus. 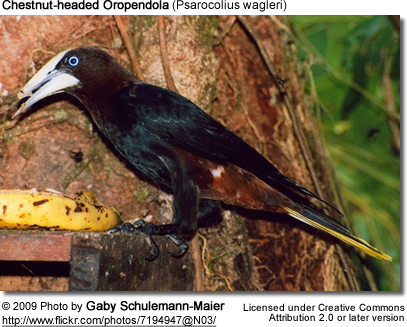 Alternatively, the Casqued Oropendola may be separated in Clypicterus, which like Ocyalus would then be a monotypic genus.